Random glitches are inevitable in mobile apps on different devices including those in the highest tiered gadgets like Apple’s special edition iPhone, popularly known as the iPhone SE. Many factors can cause an app to suddenly misbehave and determining the underlying cause is the key to rectifying it. Among the most prevalent issues transpiring in both stock or third-party apps types on the iPhone SE would include but not limited to random crashes and freezes, app update errors, and stuck on waiting status during update attempts. Pertinent issues still manifest even with the release of the new iOS 10. As a matter of fact, a number of iPhone users are being bothered by the “slide to update” error prompt after the iOS 10 update implementation. Users who are prompted with this error won’t be able to complete the app update as the iPhone screen gets stuck on the same screen. While majority of these cases are tagged among other emerging post-update issues, for some reasons others don’t have any connection to the recent update implementation. What else could have caused these problems to occur on certain apps on the iPhone SE? This question is what this post will try to address. Should you too are having trouble with an app issue on the same iPhone, then you may consider reading this entire post and likewise refer to some recommended workarounds and potential solutions. What causes an iPhone SE app to misbehave or malfunction? As the subject implies, apps problems are mostly triggered by software glitches or bugs. But there are also a few cases where the app won’t work as intended due to a faulty hardware. Like for instance when the iPhone speaker or microphone gets damaged, audio applications might as well fail work because the main hardware used that is used for sound production is not working too. Among other factors that can trigger various issues to occur while using certain apps on the iPhone SE are network problems and software glitches. Network errors can likely cause iPhone apps to not work as intended. This is especially true with network-related apps like Siri, Mail, and browser apps to name a few. When network errors occur, these apps won’t be able to function properly as each of them requires active and stable connection to access the servers. For example, a browser app won’t be able to open or browse online sites or webpages due to network outage or other transpiring network connectivity errors. Among the pertinent issues with apps that are associated with network problems would include but not limited to problems on update download and installation as depicted by error prompts like “cannot complete update,” “connection to server is interrupted,” and “connection timeout” and the like. If the network connection is not stable, server access will also be intermittent thus relevant process like downloading or updating apps is also interrupted. In cases like these, you will need to deal with network issues first so as to rectify any associated problems they have inflicted on certain apps on the iPhone SE. Software glitches or bugs are also deemed among the common culprits that can cause app malfunctions and errors to occur in mobile devices including Apple’s special edition iPhone. These bugs can come from various sources like corrupted files or downloaded contents containing some bugs or malware designed to mess up the device’s system functions or software components. When an app is infected by some bugs it will likely become inoperable or won’t work at all. The chances of getting the app back to its normal state may vary depending on which type of bugs is causing the problem and which part of the device system gets affected. Minor bugs inflicting minor issues on certain apps are likewise be rectified by a reboot or soft reset while tougher bugs infiltrating the inner system layer of the device may require a more advanced solution. Some bugs like malware are not only designed to ruin an app but rather impair the framework of the iPhone system. Memory problems are also deemed among the possible triggers as to why an iPhone app gets erratic or dysfunctional. Among the common symptoms that can be linked to a memory issue on the iPhone SE would include slow or sluggish performance, random apps crashes, unresponsive apps and other performance issues. These problems typically manifest when the iPhone’s memory is running low. Complex gaming apps, multimedia files or contents and even old messages utilize a huge portion of the iPhone’s internal storage space. The more contents of these types are accumulated, the higher the chances of performance issues to manifest sooner or later on the device. Thus, you might think that a certain app goes rogue but actually it’s the iPhone’s memory or shrinking storage space is to blame. Physical or liquid damage can also trigger similar issues to surface in various apps. That being said, not all apps problems on the iPhone SE are triggered by faulty software. Each of the iPhone apps requires both software and hardware to work as intended. Thus, if the hardware is damaged, then the software might as well not work or the other way around. For example, you’ve unintentionally dropped the iPhone or got it wet inflicting damage to certain components of the iPhone. The software or application that is associated with the damaged component (hardware) will also likely to be affected. In this case, you will need to deal with hardware problems first so as to get the app back up and running properly on your iPhone SE. How to deal with apps problems on the iPhone SE? There are various methods and workarounds you can use to deal with various types of apps problems transpiring on your iPhone SE. These methods are comprised of generic solutions and user-defined solutions that have been proven working and effective by other iPhone users who have encountered similar problems on the same iPhone device. If you are certain the apps problem you are dealing with is not associated with any damage to the iPhone’s physical components (hardware), then you might as well consider giving these solutions a try on your end. Try to delete the erratic app by pressing on it until it jiggles and then tap the Delete or X icon to uninstall and then try to re-install the app at some other time. These errors are usually tied to a server issue like the Apple server or app server might be temporarily unavailable and therefore cannot be accessed at the moment. Unstable or intermittent connectivity is also among the possible culprit in cases like this. Or you can also try updating the app or installing iOS update through iTunes using iTunes Sync option. Again you will need a computer to proceed with this workaround. Try to tap on the sidebar of your iPhone then tap on the Apps tab. Doing so will open a new window that contains a list of various apps. Select and then tap the app you are having trouble with and then tap the option to Installed. Doing so will enable the option to Remove. To remove the app, tap Remove. Apps problems that are associated with memory issues on the iPhone SE can likely get rectified by clearing up some space of your iPhone’s internal storage. To get started, check the iPhone SE’s current memory status by heading over to Settings-> General-> Usage menu. Check and ensure that the amount of Available Storage is greater than the amount of Used storage space. If necessary, try to delete unwanted apps and contents then reboot your iPhone SE. Here are a few workarounds you can try on your end. Be sure to test the app after completing each method so as to find out if that has fixed the problem. Proceed to the next applicable solutions if necessary. First solution: Quit the app and restart. If this is the first time an app shows unusual behavior or gets rogue, it might be an indication of random app glitches that can occur any time due to some minor triggers like corrupt files or contents. And in most cases, restarting the app rectifies the problem and gets the app back to its normal state afterwards. Thus, if you haven’t done it already, do it now and see what happens. Double-press the Home button or 3D Touch of your iPhone SE. Doing so will bring up the fast app switcher. Navigate to the app’s preview screen you want to quit. Swipe up on the app’s preview screen then flick it up and off the screen to shut down. After a few seconds, open the app again and see if it already back to its normal state or operation. Second solution: Reboot or soft reset your iPhone SE. So you’ve done the previous step but to no avail. If so, then the next possible solution you can try on is a reboot or soft reset on the iPhone SE. It’s the simplest yet most effective solution that is widely used to fix various types of minor software issues in mobile devices. Even some errors or symptoms triggered by memory problems are likewise rectified by a soft reset on the iPhone SE. Corrupted files, contents or applications that might have caused you this trouble can also be dealt with by a reboot on the device. After a few seconds, press and hold the Sleep/Wake button again until the Apple logo appears. Meanwhile, if the app you are trying to use is frozen or the iPhone screen itself becomes unresponsive while attempting to launch the application, then you may consider doing a force restart instead. Like a soft reset or standard restart, a force restart is also considered a safe process since no data or contents will be erased from doing so. To force restart your iPhone SE, press and hold the Sleep/Wake button and the Home button simultaneously for at least 10 seconds and then release both the buttons when the Apple logo appears. Doing so will allow your unresponsive iPhone to reboot. After the reboot is complete, try to open the app again to see if it is now working properly. Third solution: Uninstall and re-install the erratic app. If the app you are having issues with can be removed or uninstalled like third party apps, then this solution is applicable and might be helpful. Doing so will remove any bugs or glitches that caused the app to become totally corrupted, giving the app a fresh start. However, for iPhone apps that cannot be uninstalled clearing the app’s cache and data might be an alternative solution. Should you wish to give this solution a try on your end, here’s what to do next. Navigate to the apps screen on your iPhone SE and then gently press the app icon you want to delete or uninstall. Doing so will prompt you with the X icon located over the app icon. Tap the X to remove the selected app. Another way to get this done is by going to the Settings menu-> General-> Storage & iCloud Storage -> Storage -> Manage Storage. Note: Menu options may vary between carriers and device models. Fourth solution: Restore iOS or update to the latest version available. Restoring iOS to a previous backup is likely the solution you need especially if the apps problem started right after installing new version of iOS or software upgrade. In this case, the update might have contained some bugs that have triggered the application to become erratic afterwards. But before opting for an iOS restore, be sure to try some basic workarounds like a soft reset for at least 3 times. If doing so won’t be able to fix the glitch, then this time you may consider opting of an iOS restore. On the other hand, if the problem remains after performing all applicable workarounds and that you still haven’t upgraded the software or firmware on your iPhone SE to the latest iOS version available, updating iOS might be the key to resolving the underlying cause. Updates can be implemented via OTA or over-the-air (wireless) or through iTunes. To get started, head over to your iPhone Settings-> General-> About menu and then see if an update is available. A notification will show if there is an update for your device. Should you wish to proceed with iOS update implementation, select the option to Download and Install then follow the rest of the onscreen instructions to complete the process. Connect your iPhone to the computer using the supplied USB connector. Open iTunes on the computer and wait for it to recognize or detect your iPhone. Locate and select your iPhone SE from the list of available devices on iTunes. Select the option to Update or Restore. Follow the rest of the onscreen prompts to complete the process. Fifth solution: Factory reset or master reset (optional). This should only be considered a last resort should all else failed to fix the problem or you’re still unable to get certain app to work properly on your iPhone SE. 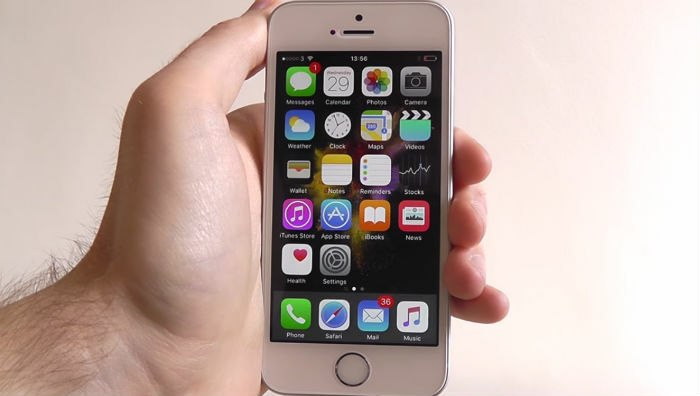 As the method implies, a factory reset will erase or wipe your iPhone and restore it to factory defaults. Having that said, all your personal contents will be erased in the process and get your iPhone back up and running as new. It is highly recommended to backup your iPhone and sign out of iCloud before doing a factory reset. Signing out of iCloud will prevent the iPhone from being stuck on the Activation Lock after the reset. To sign out of iCloud, go to Settings-> iCloud-> Sign Out. In other models, you will need to go to Settings-> [Your name/iCloud account] -> Sign Out. If you’re willing to give a factory reset a try, then here’s how it’s done. Go to Settings-> General-> Reset-> Erase All Contents and Settings. Enter the passcode if necessary. Select the option to Trust This Computer and then follow the onscreen prompts to proceed. Choose your iPhone SE from the list of devices recognized by iTunes. Navigate to the Summary panel. Click Restore [your iPhone name]. Click Restore again to confirm action. Doing so will prompt iTunes to erase all contents and then installs the latest iOS for your iPhone. Select the option to restore your iPhone as new instead of a previous iOS backup. If none of these methods is able to fix the problem and that you still end up having the same app errors on your iPhone SE, then you should now consider escalating the problem to Apple Support for further assistance and other recommendations. Meanwhile if you suspect that a faulty hardware is to blame, then you can just take your device to an authorized servicer center for further assessment on the hardware components.